In order to facilitate the wiring of micro bit development board, we specifically design this prototype breakout board V1 . 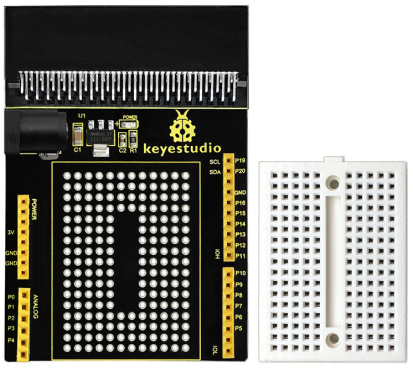 On-board comes with AMS1117 chip, and you can power micro bit via connecting external DC 4.75-12V. This breakout board breaks out all the pins and power of micro bit development board to female header, to allow easy component soldering on the board. You can also connect the circuit using small breadboard. Connect the adhesive small breadboard to breakout board. 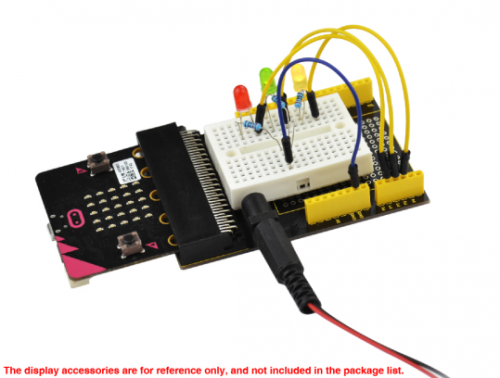 Note that breadboard and breakout board are separated in packaging. Expansion area is using double-sided PCB through-hole connection, the front and back can be welded components, on the back IO with patch pads, easy for line connection. Small breadboard is placed on the middle part to facilitate experimental expansion. For each board, we would make a full function test to ensure its normal use. In the below figure, we have used the board to control the three LEDs. 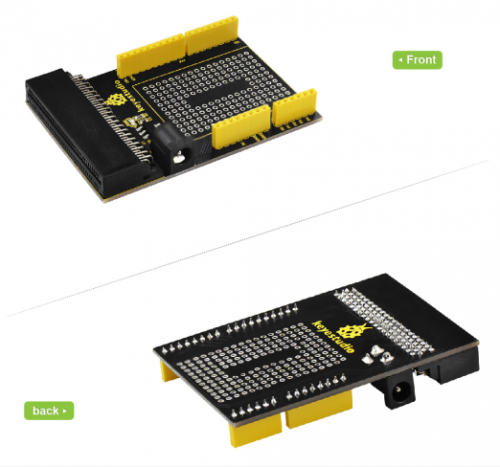 Actually, it is very easy for you to play micro:bit with our prototype breakout board V1. This page was last edited on 7 March 2019, at 14:35.